Two Rivers Public Charter School sued a handful of activists last December for allegedly creating a disruptive, distressing atmosphere for students and for harming the school’s reputation. 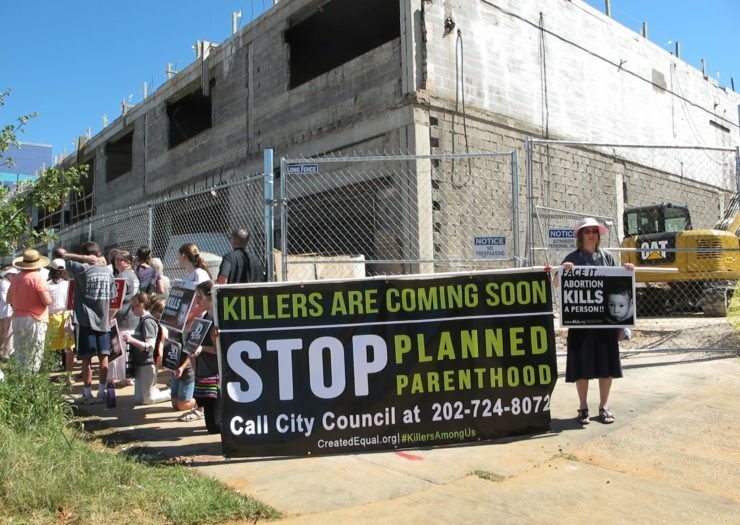 Abortion opponents protest the construction of a new Planned Parenthood center in Washington, D.C., which neighbors Two Rivers Public Charter School, on August 22, 2015. A District of Columbia Superior Court judge on Friday rejected abortion rights opponents’ motions to dismiss a lawsuit that accuses them of harassing children at a public charter school neighboring a soon-to-be Planned Parenthood center in Washington, D.C. The activists’ attorneys failed, during Friday’s oral arguments, to persuade Judge Jeanette Clark that Two Rivers Public Charter School is suing to stifle the protesters’ speech related to abortion. Clark accepted the school’s argument that it takes no position on abortion rights but is trying to protect the students’ safety and emotional well-being. “Plaintiffs have shown in their complaint [that the school] has suffered injuries and is likely to suffer injuries in the future,” Clark said during her ruling. Two Rivers sued a handful of activists last December for allegedly creating a disruptive, distressing atmosphere for students and for harming the school’s reputation. Anti-choice activists for almost a year have protested the Planned Parenthood construction site, which neighbors Two Rivers’ elementary school campus and sits across the street from its middle school campus. Local and national groups have organized protests and devised various strategies to try to prevent the reproductive health center from operating, such as pressuring contractors and trying to turn the neighborhood against Planned Parenthood. But Two Rivers took legal action after a few of these activists, on separate occasions, stood close to school grounds, where they allegedly aimed graphic signs at children, telling them that Planned Parenthood “kills kids next door” and would cause problems for the school unless their parents stopped them. The five named defendants (the school included in the suit unnamed John and Jane Does) individually filed motions this winter to dismiss the lawsuit. Defendants have argued that their actions amounted to protected free speech and that any harms inflicted upon students unintentionally result from lawful First Amendment activities. Robert Weiler Jr., who has so far represented himself in the lawsuit, told the court that in his many years protesting abortion, this is the first time he has been sued for peaceful protest. “Until this case, nobody has used the civil courts to try to shut me up,” he said. Weiler claimed that his action outside the school amounted to holding a sign on a public sidewalk and not talking to any students or parents. As he told Rewire when Two Rivers first filed its complaint, he believes he was only named in the lawsuit because of his past: he served time in prison for plotting to bomb a Maryland abortion clinic in 2006. Like Weiler, other defendants argued their actions were being unfairly lumped together. The school accuses defendants of conspiring together to create a private nuisance at the school, a claim defendants deny. Defendants accused the school of using children as a cheap excuse to suppress free speech. “It makes me wonder why Planned Parenthood has not wanted to move next to all schools,” Garza said. Several of the defendants filed motions for the court to drop the lawsuit on the grounds that it is a “strategic lawsuit against public participation,” or a SLAPP suit, which is a type of lawsuit intended to intimidate and silence critics of a particular issue. These suits can be dismissed under D.C. law unless the plaintiff can demonstrate that the claim is likely to succeed on the merits. It was on this ground that Clark denied the SLAPP motion. In its lawsuit, Two Rivers is seeking not to ban the protesters’ activities entirely, but to limit what they can show to the students and when. Though Clark ruled that Two Rivers’ lawsuit could move forward, she denied the school’s request for a temporary restraining order, reasoning that the school had not demonstrated imminent harm to the students. She ruled that Two Rivers’ board of trustees must be dropped as plaintiffs in the suit. Clark said the case would not go to trial before next year, after the Planned Parenthood at the center of this controversy is scheduled to open and protests are expected. She suggested both parties could attempt to resolve their differences before a mediator, and perhaps agree to protest terms both sides could live with. Michael Murphy, another attorney at Bailey & Glasser representing Two Rivers, told Rewire after the hearing that his team would consider filing an amended complaint to add that some of the defendants have made allegedly defamatory statements about the school, holding posters that claim Two Rivers supports abortion care. Alden Nouga, whose daughter is a kindergartner at Two Rivers’ elementary school, is well familiar with these signs. 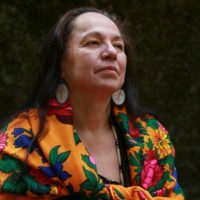 Having recently learned how to read, Nouga’s daughter asked her mother what it means that her school supports abortion, Nouga told Rewire in a phone interview. She said she used the opportunity as a teaching moment to explain abortion, as well as the concepts of free speech and diversity in viewpoints. Nouga said that, lately, protests near the school have been only occasional and that, for the most part, protesters have not been engaging parents and students. However, from time to time tensions flare between frustrated parents and protesters, she said. What would really reassure many of the parents, Nouga said, is to be able to know in advance when activists plan to protest near or at the school, so that they can prepare any anxious children. Her main concern is that the protesters present a safety issue by creating obstacles and tension during busy drop-off and pickup times in an area of the city with high traffic and construction.